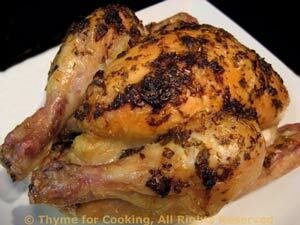 Cornish Game Hens with Herb Sauce, easy gourmet dinner recipes. There are a lot of components to this dinner, but, with the hens and potatoes roasting in the oven, it's still easy. Small, perfectly roasted hens make an elegant presentation for individual servings (with maybe a snack leftover). Remember to put bowls for bones on the table - and wet towels for fingers. 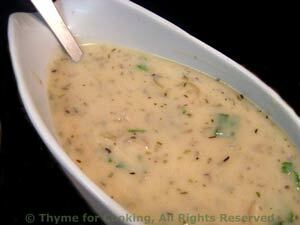 Mix 1 tbs butter with 1 tbs each of tarragon, thyme and savory. Rub the remaining 1 tbs butter over the hens and sprinkle the remaining 1/2 tbs of each herb and the salt over the top. Put into 400F (200C) oven and bake for 30 minutes. Finely chop shallot or leek. In medium saucepan sauté shallot and herbs in butter until shallot is tender. Add flour and stir constantly for 1 minute with a whisk. Slowly add wine stirring constantly to thicken. Add stock and heat, stirring, to boiling. Boil 1 - 2 cups water. Peel the garlic and cut cloves in half. Put the potatoes into a large bowl. Add olive oil and mix well. Use your hands, separating the slices to get each one coated. Spread half of the sliced potatoes in the bottom of small baking dish - just big enough to hold everything. Sprinkle with the garlic and add the bay leaves. Spread the remaining potatoes slices on top. Pour enough boiling water over to almost, but not quit cover. 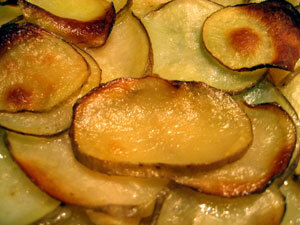 Bake, 400F (200C) uncovered, until potatoes are tender, about 60 minutes. If the top starts to get too brown cover with foil to finish. Sliced, fried in olive oil with bacon and onion, then finished with Worcestershire sauce and vinegar.... Not your usual Brussels Sprout. Slice off stem end of sprouts and remove any wilted or damaged leaves. Cut each sprout into 3 or 4 slices. Heat oil in a medium nonstick skillet over medium-high heat. Add bacon and sauté until crisp. Remove. Remove all but 2 tsp fat and oil. 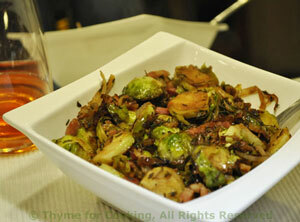 Add onions, sprouts and sauté, stirring frequently, until tender, about 10 minutes. Sprinkle with Worcestershire, Balsamic vinegar and thyme, stirring to combine. Add bacon, stir well and serve. Check potatoes, remove if done, if not 5 min.